This vehicle is without a doubt a driver's car with its distinctive dynamic and defining silhouette, strong body lines and floating roof. 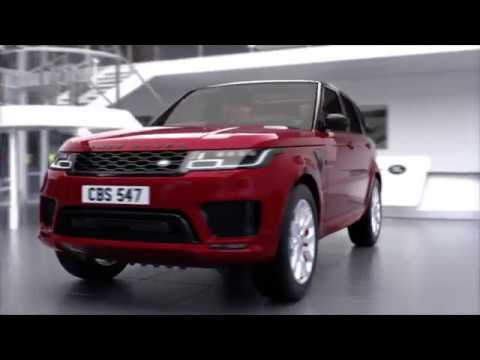 It is clear to see that every aspect of the all-new Range Rover Sport has been designed to a whole new level. A luxurious and spacious interior ensures everyone has a relaxing journey, offering passengers greater comfort with generous leg, shoulder and head room. An optional 5+2 seating arrangement is available which has two 'secret seats' stowed on the floor under the luggage compartment which are designed specifically for children and teenagers making this all-new Range Rover Sport not only a luxury vehicle but also dynamic and practical. Parking has never been made easier with the enhanced optional Parking features such as; Parking Exit which automatically exits parallel parking bays, Perpendicular Park which positions the car centrally in parking bays and the 360 degree Park Distance Control which offers virtual object tracking. A forward camera is also available which monitors the vehicle's position between lane markings. All of these parking enhancements more than ensure can park with sheer ease in any tricky situations. Further safety features include the optional Land Departure Warning System which sends a vibration through the steering wheel if the driver moves out of a lane without using the indicator, and the Traffic Sign Recognition System which provides the driver with a safer and more informed driving experience. The all-new Range Rover Sport also includes the option of the outstanding new Land Rover InControl Connected Car System with an added three new connectivity components. A new InControl Remote Smartphone app is now available on Apple and Android, allowing customers to check their Land Rover's security, lock status, fuel, washer fluid levels and tyre pressure all while being away from the vehicle. Journey tracking is also used which manages business mileage as well as establishing the vehicle's current location. The highly advanced tracking technology also helps prevent theft by tracking the vehicle and raising a silent alarm at a secure operating system, giving owners complete piece of mind. An extended choice of powertrains has been developed with the introduction of the new extremely powerful 4.4-litre SDV8 engine diesel. This new engine technology uses a revised intake system making the engine lighter with improved calibration. However, this in no way affects the uncompromising performance of the all-new Range Rover as it develops 339hp and 700Nm torque. Exclusive features for the Range Rover Sport HSE with Dynamic Pack include a Gloss Black Grille, Fender Vent, Bonnet Vent and Mirror Caps. Red Brake Calipers and Red Sports Badge, Oxford Perforated Leather seats in a choice of seven colourways are also available. With its striking exterior lines and defined styling, the Range Rover Sport Autobiography Dynamic lives up to its name. A Gloss Black Grille, Fender Vent, Bonnet Vents and Mirror Caps strike the right notes. Red Brake Calipers and Red Sports Badge, Oxford Perforated Leather seats in a choice of eleven colourways are also available.